KOKOMO, Ind. – The Kiwanis Club of Kokomo hosted its 30th Annual Girls Basketball Banquet at Kokomo High School – and to no surprise, the Neeley twins of the IHSAA Class 2A state runners-up Eastern Lady Comets dominated the awards presentations. Billed as the largest high school girls basketball banquet in the Hoosier state, the Kiwanis welcomed home former Kokomo High School and Murray State standout guard Ashley Hayes as the keynote speaker. Hayes offered the girls sound advice on working hard, achieving success at whatever one does and always strive to set one self apart from the rest. “Everyone is replaceable; make yourself unforgettable,” said Hayes. “That was first told to me by a coach at Murray State. A coach told me that there was a million Ashley Hayes’ out there. I was taken aback by that, but I realized I needed to set myself apart and make my own mark. I had to make myself different and make them not forget me. Hayes is currently an assistant women’s coach at Butler University. With her current coaching assignment, the former Lady Kat noted she has played/coached in three of the most historic gymnasiums in the United States – Kokomo’s Memorial Gym, the New Castle Fieldhouse and Butler’s Hinkle Fieldhouse. She also played in the 2003 IHSAA Class 4A girls basketball state championship game in Bankers Life Fieldhouse, then called Conseco Fieldhouse. Hayes is best known locally as a key member of the 2003 Lady Kats state champions – a team that rolled through the season and finished 26-0 as the only undefeated basketball team in 110 years of Kokomo basketball. Hayes was second team all-state and a McDonald’s All-American nominee. She is also currently ranked No. 21 on Howard County’s 1,000 Point Club with 1,126 points. The Kiwanis Club of Kokomo established this banquet in 1984 to formally recognize the athletic and academic accomplishments of local area girls’ basketball teams. The following ten high schools were included in the banquet: Kokomo, Western, Northwestern, Taylor, Eastern, Tri-Central, Lewis Cass, Maconaquah, Carroll and Tipton. 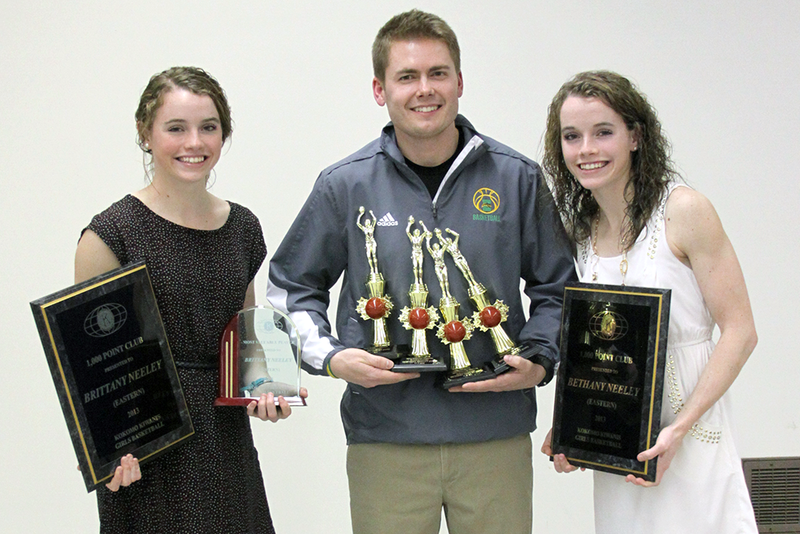 This year, Brittany and Bethany Neeley garnered five of the six on-court awards the Kiwanis Club dishes out. Brittany was named the Kiwanis Most Valuable Player, as well as assists leader (5.2 assists per game) and scoring leader (17.2 points per game). Bethany won the rebound leader (11.6 rebounds per game) and steals leader (6.3 steals per game) awards. Tri-Central’s Shelby Ramsey won the free throw shooting award (76-percent), edging out Bethany Neeley by less than a half of a percent. The Tipton Lady Blue Devils earned the award for highest team grade point average, posting an impressive 3.56 GPA to defend its crown from a year ago. The top award of the evening was a $500 scholarship from the Kiwanis Club of Kokomo Foundation to the senior player with the highest grade point average. This year’s scholarship was awarded to Erin Kesler from Northwestern High School.